Automatically rotate the property photos to generate more interest and views from your audience. Choose to do all photos, or a select few. Rotating property photos can lead to more interest in properties. It can give properties a fresh feel, especially to users who have viewed the property in the past. It can also be good for Search Engine Optimisation as it means content is being changed on your website. With this add on we take the hassle out of changing the photos by doing it on your behalf automatically at set intervals. Once the plugin is activated you’ll have the ability to change a few settings. You can choose whether to rotate all photos or a select few (this avoids getting a toilet as the primary photo), and the frequency that this the image rotation should occur. 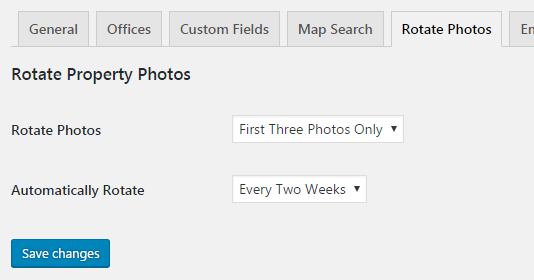 Once setup you can sit back and let Property Hive manage the rotation of photos on your behalf. Property Hive has got to be the best plugin for UK Estate Agents using WordPress for their website. The plugin has been well thought out for the needs of agents and is very well built. Their support is also top notch – far exceeding expectations. Keep up the great work and well done! – Please note that this add on won’t work if you’re using our Property Import add on to import properties into Property Hive as the order of the photos would get overwritten each time an import runs.